Furnishing our children’s rooms with a playful but sophisticated vibe can sometimes be a tricky proposition. For picky parents (myself included) finding something as simple as a coat rack for the littlies can be an arduous task. 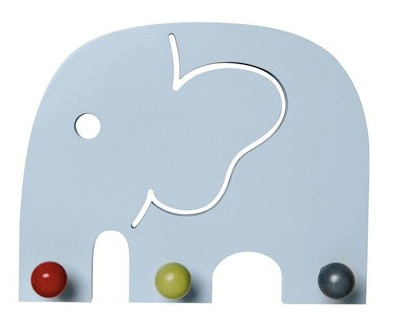 That’s why I am smiling from ear to ear upon seeing the Oscar Elephant coat rack from Danish company Franck & Fischer. It’s a bit reminiscent of the Eames Hang-It-All with its brightly coloured round hooks but with a sensibility that will attract little people. 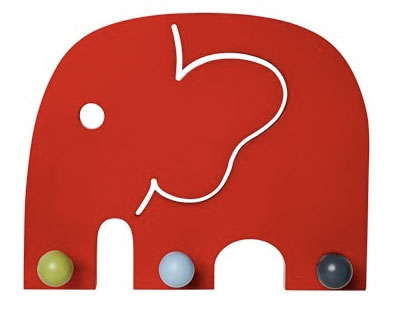 I can already hear my daughter requesting to use ‘her’ elephant to hang her coats and various trinkets on. Franck & Fischer (we featured their toys last year) pride themselves on producing the highest quality products in an eco-friendly and ethically made manner. Case in point: the coat rack is made from plantation rubberwood trees and painted with non-toxic paint. Available in either red or blue – I’m lovin’ the red – it’s available in Australia for the first time from Bébé for $64.95 plus postage.